The historic Wicomico County Courthouse is recognized as one of Salisbury’s most iconic and beloved architectural gems. It has been a civic landmark and anchor of the city’s historic downtown since 1878. The Maryland Historic Trust has described it as “a fine example of Victorian Gothic public architecture and it is an imposing structure on its site. While the building has been expanded three times during (its existence), the original 1870’s design has been largely respected.” The building is notable for its asymmetrical pressed brick and stone design dominated by the three-story stair and clock tower on the northwest corner. The sides are punctuated with narrow elongated windows with keystone and impost block arches above. The mansard design main roof and towers are covered with three different profiles and sizes of native slate, which were thought to be original construction. The main roof is framed with massive hand-hewn heavy timber trusses. A 2013 general architectural/engineering survey of the 1878 structure revealed extensive deterioration of the building shell, including major structural problems to the stair/clocktower, leaking roofs over the entire structure, general rot and breakdown of the original decorative wood cornices and trims, a failed clock mechanism with plywood-covered clock faces, masonry settlement cracking and spalling stone surfaces. Extensive long-term wind damage, exacerbated by a 2016 lightning strike, most recently had stirred fear the clocktower was in potential danger of failing and toppling over completely, thereby creating a public hazard. GMB was commissioned in 2016 to do a comprehensive physical survey of the Courthouse superstructure and develop a detailed plan and cost estimate to secure and restore the two towers and main roof. This effort involved preparing measured drawings of the building exterior through reconstruction of old blueprints, doing detailed interior measurements, and preparing a birds-eye photographic survey from a two-man lift basket suspended from a crane. Locating the crane on the narrow street below created a logistical navigational challenge and the need for street shut-down and traffic control. With the uncertainty of cost weighed against the budgetary priorities for the project, GMB prepared comprehensive bid documents, with defined cost alternates and work phasing. The project was bid in early 2017, and the construction contract was awarded to Ceepco, Inc. of Silver Spring, Maryland. 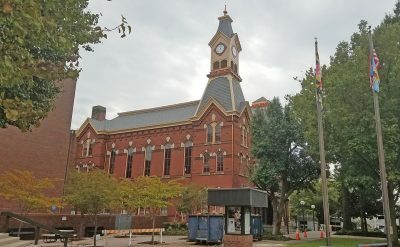 Despite the inherent challenges of renovation construction and the responsibility of maintaining strict historical accuracy, the project was substantially completed successfully in time for Wicomico County’s 150th Anniversary celebration in September of 2017. Wicomico County’s hands-on approach and determination to honor the original structure helped guarantee a high level of workmanship and attention to the smallest of details. Making the choice of using natural slate roofing instead of newer generation composite slate-like shingles will sustain the historical legacy of the original 19th-century building. Rebuilding the iconic clocktower with contemporary state-of-the-art structural technologies, replacing the clock faces and clock mechanism, installing a lightning protection system, and insistence on using durable real woods like African mahogany (Sapele) in siding and trim replacements, and using real copper flashings all will help keep the historical integrity of the courthouse for years to come.